← Validating Game Taken Over a Weekend? Question: I have been studying up on different methods of spear fishing while free diving and have read about the use of “glitter” as an attractant for bait fish. I have an idea to sprinkle glitter in the water so that when the bait fish come to investigate, the large game fish will follow and be caught as they attack the bait fish! The activity you describe would be considered chumming. According to DFG Game Warden Michele Budish, chumming is defined as “placing any material in the water, other than on a hook while angling, for the purpose of attracting fish to a particular area in order that they may be taken” (California Code of Regulations Title 14, section 1.32). Chumming in the ocean is allowed, but chumming in freshwater is permissible only in specific areas and for certain fish species (see CCR Title14, sections 2.30 and 2.40). 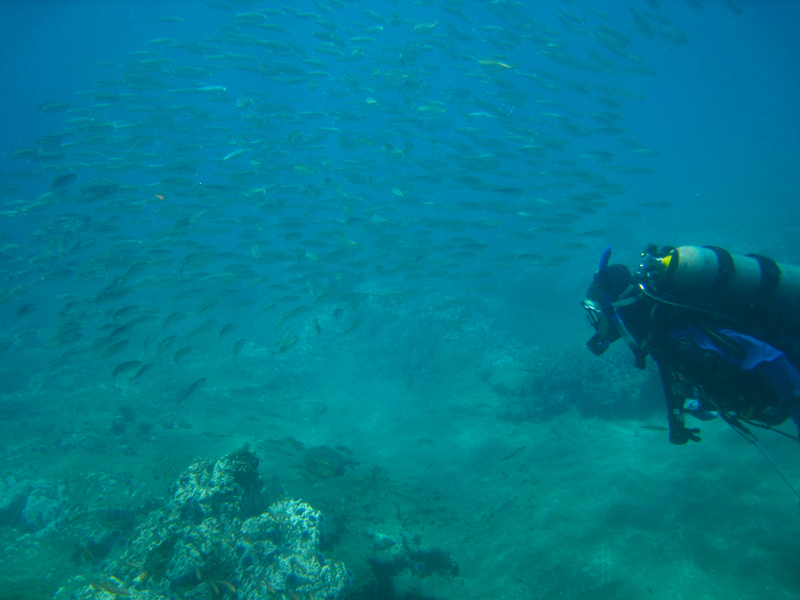 Question: I was diving in Sonoma County last weekend (Aug 28) in Fisk Mill Cove. The water was dirty as if there was a plankton bloom and visibility was only four to five feet. On my very first dive to about 12 feet I looked into a cave in the rocks with my light and saw something I’ve never seen before in 50 years of diving for abalone. There was an abalone laying upside down and clinging to a piece of kelp rather than clinging to a rock like usual. My dive partner told me he picked up two similar abalone on one dive. They were also in a rock cave just laying upside down on the rocks. Later we met two other divers who had been diving at Timber Cove the day before and they too came across a couple of abalone laying upside down on their shells among the rocks. Answer: What you observed last weekend in Sonoma County is a rare die off event and your observations are similar to many reports we’ve received from other abalone divers in the area. All of the reports mention abalone observed lying upside down on the bottom and the water a dark brown color with visibility less than a foot. Reports have come from Fort Ross State Park, Russian Gulch, Timber Cove and Salt Point State Park where the abalone are dying. According to DFG Senior Marine Biologist Ian Taniguchi, these abalone deaths coincided with local phytoplankton blooms (red tide), accumulations of drift kelp and calm ocean conditions. Similar invertebrate die-offs have occurred along the North Coast in the past, typically inside protected coves and under similar ocean conditions. The abalone deaths may be due in part to the large phytoplankton bloom, but the investigation is still ongoing. While we don’t know exactly what’s causing the die-offs, we do know they are not due to Withering Foot Syndrome – a fatal disease found in some Southern California abalone. Withering Foot Syndrome is specific to abalone (in this case, sea stars appear to be dying as well) and causes the abalone’s body to shrink (also not the case in this instance). The California Department Public Health (CDPH) is collecting samples of shellfish for analysis from the affected area and advises recreational consumers to be cautious and not consume seafood that may have been affected by the bloom. CDPH will post their analysis results as soon as they are available at http://www.cdph.ca.gov/programs/Pages/DDWEM.aspx. This entry was posted in Abalone, Fines/Penalties/Citations, Food/Health, Methods Of Take, Regulations, Wildlife Management and tagged abalone, baiting, Diving, fishing, freshwater fishing, invertebrates, ocean fishing. Bookmark the permalink.